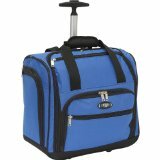 Proper carry on luggage can make air travel easier and more fun, particularly carry on luggage with wheels. And with all the various check in luggage fees airlines have been adding, packing a carry on can often save money as well. Our goal at CarryOnLuggage.info is to help you find the right piece of luggage for your trip as quickly and easily as possible. We’ve organized the bags by various categories such as by brand, color, and style to make the selection simpler. Hope the site helps you find the bag you’re looking for. What’s the best carry on luggage? This depends on the particular traveler and the particular trip. A business traveler going on a 1 day trip with no overnight stay may look for different features in a carry on than someone going on a multi-week international journey. 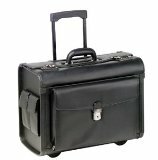 One of my favorite types of carry on luggage for a very short 1 day trip is a litigation rolling briefcase. For medium length trips, its often a good idea to have one piece of carry on luggage with wheels, and then a second smaller personal bag like a duffel bag. For long trips, a large hard shell case to be checked can be a good bet. As for brands, there’s many high quality brands available, but I’m definitely partial to Travelpro luggage. Look what flight attendants and pilots carry, and much of the time it’s Travelpro. For selecting your luggage, my advice is to browse the various types of carry on luggage described on this site such as litigation rolling briefcase or some of the other examples on the various pages listed on the menu to the right, to get an idea of the options available. And consider what you’re looking for in a bag: is the weight (lightness) most important to you, that it has wheels, the color or brand, etc…? You also might get a variety of carry on bag styles so that you can choose the right piece for each of your various trips. Also be sure to check that the luggage you choose to take on a trip adheres to the particular airlines luggage size policies. One tip I almost always follow is to take along a collapsible duffel bag which folds in upon itself. This can then be taken on your outbound flight in the collapsed state, and then on the return filled either with worn clothes and checked in, so that your primary carry on can hold gifts for those back home or other items picked up on your travels. Good luck in your search for functional and stylish luggage. Hope this site helps you in your search for the perfect carry on luggage for your travels.